So I have been trying to get my cub to start- I need to make sure the carb is set as it should. I just pulled it out of the box its a new original style TM carb. I have questions that my carburator-to-governor shaft or something with the lever rod assembly is also improperly set up and I need to make sure we are set at 1/3 throttle so I can start up. What's 1/3 throttle supposed to look like on the throttle butterfly or the throttle lever and shaft assembly of the carb? I'd like to see if I can get the tractor idling without the carburetor-governor shaft assembled. Also, so curious what the original choke throttle on the cub looks like, I think I need to get one as I can't run my electric start w/ out it. Be careful tightening the gas line connection, or the mounting studs on the IH carburetor, it is soft metal, the threads strip out tightening things too much. I have found that the idle mixture screw usually needs to be set about 1 1/2 turn open, on the IH carb. The owner's manual tells how to set it. It says warm up the engine before making the setting. I guess you are saying you don't have the choke lever on the carb, or the choke rod. The choke rod has a loop on the top end that matches the starter rod loop. The choke rod goes on the left side of the dash. Here is a new choke rod at TM Tractor, and a new choke lever for the carb. Here is a pic of from TM Tractor of how the lever for the choke rod goes on the carb, it usually has to be in this position. Below are pics of the choke rod in position. Thanks for the helpful information Glen. I'll be getting a replacement choke rod soon. Luckily, I traded a couple of my piglets to a professional mechanic for his trade in some tractor help and he's helped me demystify the carb a little since my original post. Most adjustable needle valves will be "close" if you turn them in all the way and back them out 1.5 turns. Finger tight closed is plenty. Don't overtighten it. 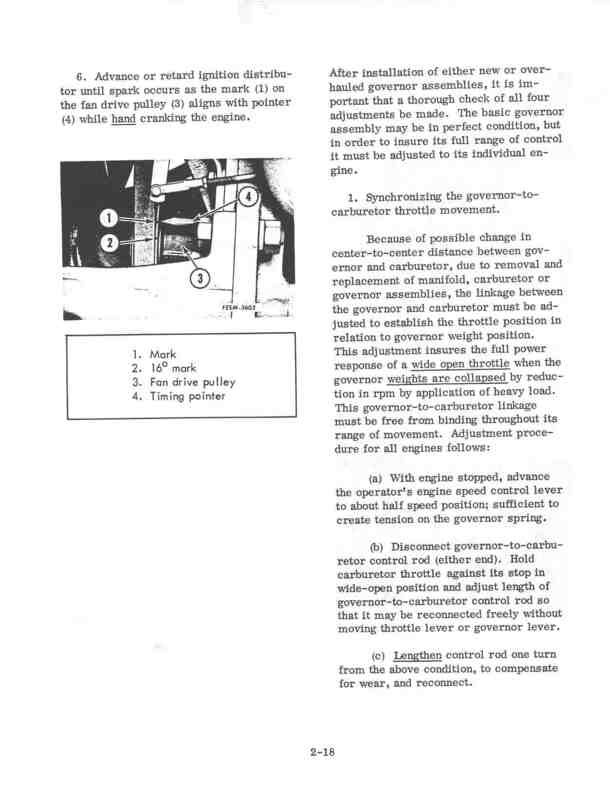 If the governor is working properly you "time" the governor to the carburetor by disconnecting the throttle rod on the left side from the governor up front (yoke with a pin through it). Push the throttle lever all the way ahead, which should cause the governor to move ahead where you just disconnected it. Now adjust the length of that throttle rod by turning the yoke in or out on the threads until the pin will just slide through the yoke and governor arm easily, while you hold the throttle on the carburetor wide open. Generally speaking it does not need much adjustment, so if you find yourself turning it in or out by more than 1 or 2 revolutions, you may be doing it wrong. Once this adjustment is done the throttle lever should properly control engine speed. 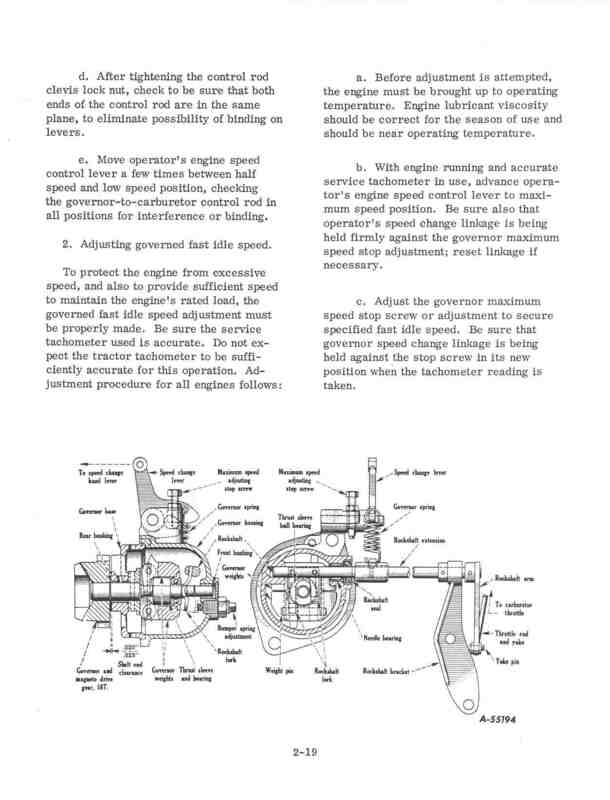 Matt, here is a page from the Cub service manual, GSS-1411 telling how to adjust the throttle rod, you were talking about. It says open the throttle about half way, not fully. Notice the subject is at 1 on the right side of the page, and then read paragraph A below that. Then there are 2 more paragraphs on this page, if anyone is wanting the whole procedure. I find myself back to the carburator now... My "new" '53 is hard to start up. I'd like to get it to start up great and just purr. I haven't looked at the plugs or wires yet but I will double check Coil spark tomorrow and then follow to the spark plugs. But I wonder if its the carburator. I usually flood it if I don't get it just right and then I just myself trying to start with starter fluid or pulling the drain plug on the bottom of the carb to let it air out... Once the engine is running, she runs good and doesn't overheat. But even just after running for some time seems hard to start again so I took the carburator off and inspecting the float action it appears to work as it should... Except when on the tractor the carburator seems to flood if the tractor isn't running, (so I always turn my in-line fuel valve off) maybe this makes sense since the carburator float is supposed to keep fuel in the bowl. -I'll check the idle spring tomorrow and then double check the governor is adjusted properly to the carb. Also I am so tired of those carburator attachment holes stripping out, going to jd weld the carburator mounting bolts to the carburator body on this one. Running ok, but hard to start due to flooding sounds like a needle valve issue. If the valve won’t seat, it will continue to pour gas into the carb. If the engine is already running, it will keep ahead of the flood if it’s not too bad. If the engine stops, though, it will flood and it won’t start. It could be as simple as crud in there interfering with the valve closing. Clean the needle valve (and the jets and screens while you’re in there for good measure). Check both the float height and float drop if you haven’t already, and then check if your float leaks. Try shaking it. If you feel/hear fluid in the float, you’ve got a leaker. If it seems ok, try a final check of submerging it in very hot water. If it gives off bubbles, it leaks. A float that leaks becomes too heavy and so will also cause the carb to flood. Does gas eventually start to drip out of the carburetor if you turn on the gas and just let it sit there without trying to start it? If not, the needle valve isn't leaking. This sounds like you are over choking it when you try to start it. Do an ignition tune-up then go easier on the choke. Jim Becker wrote: Do an ignition tune-up then go easier on the choke. Yup. Ignition has to be spot on. Firing the spark plugs a degree or two prior to the piston reaching TDC will make the tractor hard to start. You might want to do a complete engine tune up; compression tests, valve tappet adjustment, etc..
Jim Becker wrote: Does gas eventually start to drip out of the carburetor if you turn on the gas and just let it sit there without trying to start it? If not, the needle valve isn't leaking. Does anyone know how to tell if the main metering jet is out of alignment. I took both carbs apart and I have two different metering jet hole angles. While looking into the bowl one hole is facing 90 degrees parellel to the bottom of the carb the other is more of a 45 kinda making alignment with my eyes if I drew a line in its direction the hole would just point towards the bottom upper lid of the bowl. Don McCombs wrote: The alignment doesn't matter. Ok then, this is good to know. Thanks Don. Yes, I know what you mean. I've got a '42 model that is the same way. Starts cranky and creaks a lot. '42 model? Yes, me. I'm sorry, I couldn't pass up the opportunity.